It's been a few weeks since President-elect Donald Trump celebrated Carrier's decision to keep some factory jobs in Indiana rather than move them to Mexico. The deal hinged on $7 million in state tax credits, some of which came from a rarely used fund for job retention. It has other manufacturers wondering what the deal might mean for them, as Indiana Public Broadcasting's Annie Ropeik reports. ANNIE ROPEIK, BYLINE: Indiana doles out tens of millions of dollars in tax incentives to companies like Carrier every year, but usually those are for creating new jobs, not retaining existing ones. Andrew Berger, a lobbyist with the Indiana Manufacturers Association, says that's because it's easier to measure the economic benefit of a new job than one that was already there. ANDREW BERGER: The overall goal is to grow the income base, not just maintain it. So that's I think the policy decision on why it's such a - retention is such a small portion. ROPEIK: Small portion indeed. The Indiana Economic Development Corporation caps its credits for job retention at $10 million a year, and it's only actually awarded $15 million total since 2005. Compare that to awarding $1.2 billion in job creation credits. So deals like the Carrier one are rare. In fact, it'll eat up 5 percent of all the state's job retention funds over the next decade. But what's to stop companies from feeling emboldened by Carrier asking for more of that money? Not much, says Berger, but with the spectacle around Carrier and uncertainty around other reforms, most businesses seem cautious. BERGER: My guess right now is that people are kind of in a wait-and-see mode, particularly if they haven't kind of committed to, you know, an investment overseas, whether that's in Mexico or anyplace else. ROPEIK: Employees are waiting, too. At Rexnord, another Indianapolis factory Trump has criticized for plans to shift jobs to Mexico, production worker Tim Mathis has his hopes up. 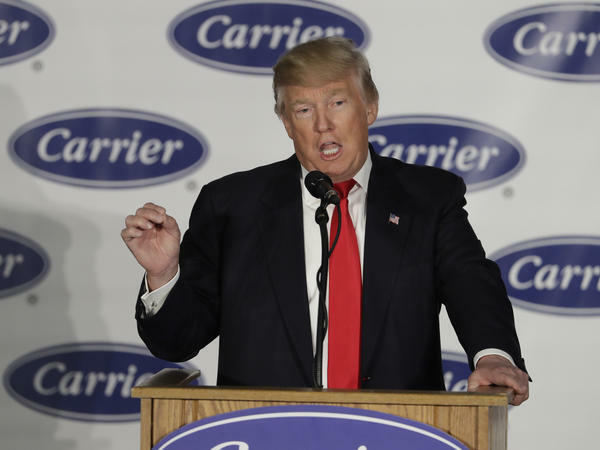 TIM MATHIS: We're tickled to death that President-elect Trump was potentially able to save Carrier's jobs. But we also want our jobs and all the other jobs that are being sent out of this country. We want our jobs to stay as well. ROPEIK: It's shift change at the TRW factory in Lafayette, Ind. Most workers are already inside for their 5:30 p.m. start time. They're going to be making commercial steering equipment for big rig trucks until about 3 a.m. tonight. Now, there are two Lafayette TRW factories, and the other one is going to be closing in just a few weeks' time. Some of its workers are going to come here, and some of them are going to be laid off. LARRY DEBOER: You know, so what's the balance between carrots and sticks on that sort of thing as well? ROPEIK: Larry DeBoer is an economist at Purdue University and says companies like TRW don't really face penalties for offshoring jobs. The company wouldn't comment on the role its overseas business played in the 65 layoffs it's planning in Lafayette, but workers did get a federal certification saying the jobs were impacted by global trade as positions move to China. DeBoer says the company could have asked the state for retention money or incentives to expand its factories or teach workers new skills instead of firing them - all breaks Carrier got. But what happens if that's still not enough to keep jobs here? DeBoer says companies need more than just incentives. They're watching to see if Trump will impose the kind of offshoring penalties he campaigned on. DEBOER: Eventually there's got to be some nationwide policy passed by Congress presumably that addresses this problem, but you can't possibly have the president occupy himself business by business by business every time there's a report that somebody's going to move offshore. ROPEIK: Or can you? Expectations like DeBoer's haven't seemed to limit the president-elect so far. He has pledged to make some big trade and regulatory reforms in his first hundred days in office. For NPR News, I'm Annie Ropeik. Transcript provided by NPR, Copyright NPR.